It's Canada Day, so I would be remiss if I didn't take the opportunity to recommend some Can Lit. There are lots of great options, but few contemporary (or, relatively contemporary) Canadian authors have captured Canada's many personalities, landscapes and humour like Farley Mowat. 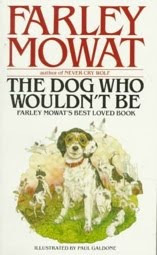 In The Dog Who Wouldn’t Be, Mowat chronicles his childhood – spread through Saskatoon, Toronto and small-town Ontario, with travels to the Pacific coast – and the many adventures he had with his dog Mutt. Mowat, known best for his writings about the natural world, is hilarious when he writes about himself. I remember reading The Dog Who Wouldn’t Be as a kid and just laughing away; when I reread it this week the same thing happened. I couldn’t help myself. Mowat is so good at the set-up that you chuckle in anticipation of the jokes, catching the wry introspective side of them that children miss. The memoir begins with the Mowat family’s move to Saskatoon in the middle of the Depression dustbowl. Mowat’s father Angus is a librarian and, upon arriving in the prairie city, is determined to be a bird hunter. Naturally, this means they need a bird dog to take hunting. After Angus enthusiastically pursues some very expensive dogs, Mowat’s mother takes matters into her own hands and buys a puppy for four cents from a boy trying to sell baby geese for ten cents apiece. Now that the family has a dog – much to little Farley’s delight – there’s no need for an expensive fancy one. Mutt doesn’t take to hunting right away, but when he figures out his role he goes at it with gusto, to the point that he becomes famous for his retrieving. In fact, Mutt is singularly gifted at picking up new skills. Not only does he become an excellent hunting dog, but he trains himself to walk along the tops of the neighbourhood fences; learns how to climb up and down ladders; and manages to become an accomplished tree-climber (although tree-descending proves a skill he can’t quite master). Although most of the anecdotal chapters revolve around Mutt, the details Mowat weaves into the story about the time period and the various places he lives introduces a narrative thread into what might otherwise be a collection of bedtime stories. Mowat is growing up with Mutt and his changing interests – almost always involving animals and natural history in some way – suggest the passage of time without being obvious about it. Probably my favourite part of The Dog Who Wouldn’t Be, though, is Mowat’s portraits of his parents. 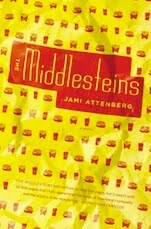 They come across as being both very much of the time period and also unwittingly eccentric. It’s certainly not every family that adopts two great horned owls and then allows them to have the run of the house; nor who would let their young son be in possession of formaldehyde (for dissections, of course). Mowat must have had an interesting time looking back at his parents and analyzing them from a character perspective when he wrote his memoir. There aren’t a lot of personal details, but it does seem clear that the three of them got along very well, and were all fiercely loyal to Mutt. The Dog Who Wouldn't Be is a quick read, and the chapters are self-contained enough to be read one at a time, whenever you have a spare half hour or so. This makes it a great summer read (because even in the summer it can be hard to find hours of successive reading time), but also a book that can carry you through a year, or a road trip. Much like the many Canadian cliches, Mowat's memoir doesn't demand anything of you, but will have you laughing at his improbably memories if you give it a chance. The chain-hyperlink twine fence is recognized as typical recommended site. In addition to the brand new California-style layout and the vinyl coating, the chain-hyperlink cord fence is extra like merely a pedestrian fence layout, because of its recognition in business and game sites review. Woe is the independent bookstore?